SUPERAWESOME celebrated the 20th anniversary of groundbreaking alternative art and culture magazine GIANT ROBOT. The 7,200-square-foot exhibit was co-curated by GIANT ROBOT visionary Eric Nakamura, and presented new or recent works by California and international-based artists affiliated with the influential magazine that brought Asian, trans-Pacific popular culture to mainstream audiences in the United States. I served as the lead graphic designer on the project, providing concept and branding, exhibit graphics, advertising, and marketing collateral. Amanda Boesen handled in-gallery typography and other supporting elements. In addition, I was responsible for designing the accompanying exhibit catalog, along with support from Tom Klump at inktank design. The poster for the exhibit won Honorable Mention in AAM's 2015 Museum Publications Design Competition. 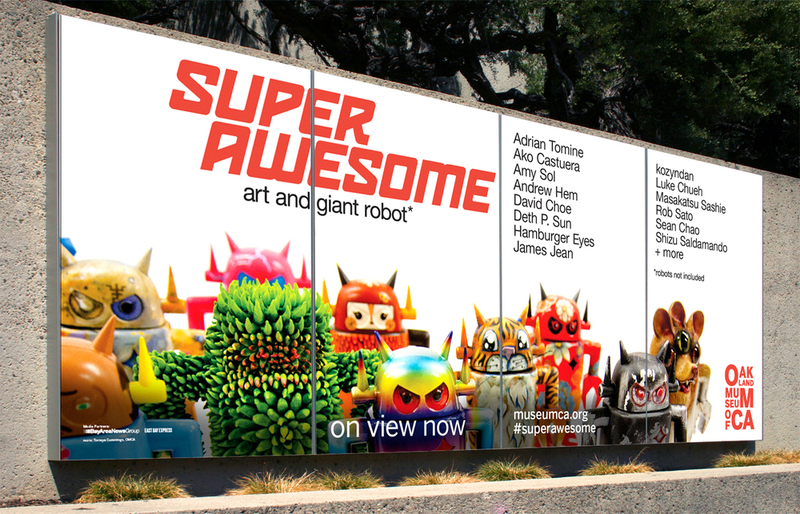 The overall concept for SUPERAWESOME was that it was an ultimate superlative, a metaphor for anything that GIANT ROBOT showed interest in and deemed cool during the run of the magazine. It became a larger symbol for the Asian-American subcultures that the publication celebrated and popularized in the 1990s and 2000s. The lobby entry wall was designed to resemble a b-movie poster, using sci-fi and kung fu elements, complete with the requisite credits block. A number of vernacular pieces, from lunchboxes to skateboard decks and Nintendo cartridges, expressed the notion of SUPERAWESOME supurlative through well known brands. The "GIANT ROBOT ENTERTAINMENT SYSTEM" was installed in the gallery for visitors to play classic NES and Famicom games. One of the most fun elements was a series of punk rock flyers that adopted the graphics and style of underground bands like Black Flag and Suicidal Tendencies. Sumo wrestlers, skateboarding, Star Trek, and Voltron also proved to be excellent fodder. The primary lettering had its basis in House Industries' House 3009 Spaceport, and was also hand-rendered in 3D for certain marketing applications. Early on in developing the exhibition identity with Eric Nakamura, I showed him countless drafts, each emphasizing a different aspect of GIANT ROBOT culture. Almost as an afterthought, he remarked "Can we use them all?" Thus began a journey through many diverse aesthetic styles and logo marks. SUPERAWESOME became something of a container that could be simultaneously injected into numerous concepts. Many were used in the exhibit in one form or another. These vernacular identity explorations reflected the diversity of art, art objects, and pop culture collections on display. Showcasing many of the custom GIANT ROBOT toys featured in the exhibit, the primary campaign image captured the feeling of an army of imposing freaks of nature storming the frame. "*robots not included" was a nod to the packaging disclaimer we all grew up with (find your own batteries), and also addressed curatorial concerns that audiences would think there would be actual robotics on display. Alternate ad concepts introduced later into the show run included artists working in situ. It was exciting to collaborate with Eric Nakamura on the design of this limited-edition, 80-page collectible publication for SUPER AWESOME. The content was culled from past issues of GIANT ROBOT, augmented with new artist interviews and essays by curator Carin Adams, zine publisher Aaron Cometbus, noted academic Konrad Ng, and Eric himself. The cover features an impressive hot pink foil stamp, and a blank GIANT ROBOT toy that allows the reader to inject whatever image or concept they wish. The campaign imagery of the "robot army" served as an excellent companion to Eric Nakamura's essay. We decided that the typography, flow, and whitespace should suggest the original GIANT ROBOT magazine, yet also carry the quieter refinement due a more traditional exhibit catalog. As such the presentation is more restrained. Initially there was greater variety and energy in the type treatments, but we dialed it down in favor of clarity and consistency. The back cover shows, quite literally, the "back" of the blank robot.